The Saturday 12:00 PM tour meets in Pack Square at the Zebulon Vance Memorial in downtown Asheville which is located at the intersection of Patton Ave and Biltmore Ave. The first stop, Pisgah Brewing, are local favorites who specialize in organic beer brewed with whole cone hops. Their flagship brew is the award winning Pisgah Pale Ale which started out over a decade ago as a home brew recipe of Pisgah's owner, Dave Quinn. Along with the Pale Ale, they brew a variety of year round styles as well as seasonals. Pisgah also has the largest outdoor concert stage in the area which hosts several nationally touring acts every year. From Pisgah Brewing we will head into the Historic Biltmore Village and visit the French Broad River Brewery. 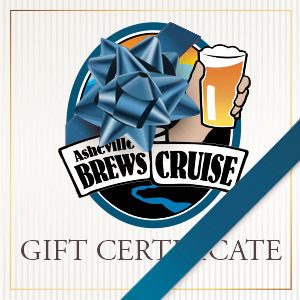 Since their beginning in 2001, French Broad River has been known for brewing World beers with Asheville style such as the German Gateway Kolsch, English 13 Rebels ESB, American West Coast IPA and the Wee Heavy-Er Scottish Ale. The final brewery of the tour is Hi-Wire's large scale production brewhouse know as the Big Top. Hi-Wire brews the only true year round lager in Asheville as well as a variety of ales such as the Prime Time Pale and Bed of Nails Brown. Hi-Wire has a large bottling line and conveniently packages their products for distribution. From Hi-Wire we drop off back downtown at the Vance Memorial where you'll have the rest of Beer City at your fingertips!